Alameda County District Attorney Melissa Krum, left, speaks to the Chauncey Bailey murder trial jury (Errol Zachery sketch). 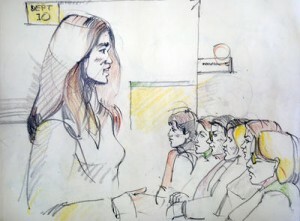 Alameda County District Attorney Melissa Krum, left (Errol Zachery sketch). Those words were among written rules of conduct for members of Your Black Muslim Bakery and the orders of Allah “came through the mouth of (bakery leader) Yusuf Bey IV,” the prosecutor in the Chauncey Bailey murder trial told jurors Wednesday in delivering her closing argument. That terror, she said, included ordering the death of Bailey, 57, editor of the Oakland Post, on Aug. 2, 2007, as well as ordering the shooting deaths of two other men that summer, Michael Wills and Odell Roberson. “He thought he could kill a reporter to stop a story or avenge stories already written,” Krum said as she gestured toward Bey IV sitting at the defense table in a cream-colored suit next to his co-defendant, bakery member Antoine Mackey. Bey IV and Mackey, both 25, have pleaded not guilty to murder charges in the deaths of the three men, and they face life in prison with no possibility of parole if convicted. “This is a man who is taking credit for a heinous act and he thinks it’s hilarious,” Krum said. A few minutes later, Krum showed a portion of the video where Bey IV jokes and laughs about Bailey’s corpse being “all stuffed up” — bringing tears from several female members of Bailey’s family as they watched in the audience. When an autopsy photo of Bailey’s head wound was shown, the women looked down, one placing her hands over her face. Krum began her argument after two months of evidence by saying Bey IV is not “a normal person.” The bakery, she said, “had a gang mentality” and its leader had an incredible ego and thought he could get away with whatever he wanted. But, she said, he spoke truthfully about being ordered to kill Bailey and his testimony is supported by evidence, including cell phone records, ballistic reports, data from a tracking device hidden on Bey IV’s car, the testimony of other witnesses, and statements Bey IV gave to investigators. Defense lawyers Gene Peretti, representing Bey IV, and Gary Sirbu, representing Mackey, have repeatedly said Broussard is a liar the jury will not believe. They are expected to begin closing arguments Thursday. But “what (Broussard) says rings absolutely true with what we know from other sources,” Krum said. Krum also described, although in lesser detail, the Roberson and Wills killings. As Krum spoke, Wills’ mother sat in Judge Thomas Reardon’s courtroom, both her hands wrapped around the arm of one of her sons. Wills father was also present. Krum said Mackey was at the scene when police responded to Roberson’s shooting on July 8, 2007. “He’s not a stupid man,” she said, so rather than run, Mackey waved a police officer toward the 31-year-old’s body. Mackey testified Tuesday that he was making a late-night candy run to a liquor store when he saw the body. Evidence Krum discussed Wednesday morning shows that Bey IV was convicted of stealing the shotgun used to kill Bailey during an attack on an Oakland liquor store in 2005. Evidence also shows that Bey IV asked Mackey to wake him up at 5 a.m. the day of Bailey’s death, which phone records confirm. Mackey testified Tuesday that Bey IV wanted to be awakened to pray. Mackey and Bey IV also exchanged two phone calls minutes after the shooting, Krum said. At the same time, the owner of the getaway vehicle, a white van, was calling Bey IV asking where the van was. Mackey said he didn’t remember the contents of those calls after the shooting. She also said that an absence of phone calls between Bey IV and Mackey after Bailey’s death, when Broussard said the three were together and driving by the killing scene and then stopping by Lake Merritt and other places to talk, confirm Broussard’s testimony. Data from a tracking device hidden on Bey IV’s car also confirms the route the three took. When the data shows the car returned to the bakery, Bey IV and Mackey exchanged 22 cell phone calls over the rest of the day, Krum said. Contact Thomas Peele at tpeele@bayareanewsgroup.com. Follow him at Twitter.com/thomas_peele.